Eek! Look at all those windows (and doors)! Windows with shutters or a windowbox (each with multiple copies in 2 sizes) plus 2 styles of doors and a round window. 13 in all. These are sized so you could use from 1 to 4 on the front or sides of the Mini House Front Box (and Mini House Album, which is shown in one of the photos above and has the same size house shape as the Mini House Front Box). Note: this comes shipped in a flat sheet. almost completely cut out, save a tiny (1/8") spot that you can snip with scissors or a sharp blade. Keeps all the pointy details from being banged up during transit. A subset of these are also included in the Spring Farmhouse Kit; see all the other kit components available to buy separately. 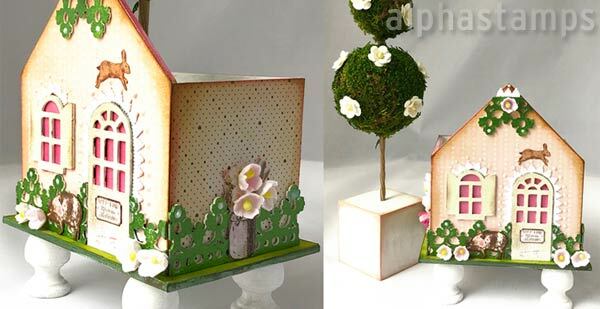 Design Team Member Lora Mahaffey made a Little Topiary House (see the wide photo below). More info in the blog and/or see the supply list.